Ahmedabad, founded in the year 1411 AD is located on the banks of river Sabarmati. Ahmedabad has been named after Sultan Ahmed Shah, who was primarily responsible for building it. Today, this city is known as the Manchester of the East. One of the highly industrialized cities in India, Ahmedabad is also IndiaTextile City. The old city of Ahmedabad is dotted with labyrinthine bylanes called pols. The exquisite carved wooden mansions and havelis are in no manner less than their stone counterparts in Rajasthan. The city is full of architectural delights. Though the capital of Gujarat was shifted from Ahmedabad to Gandhinagar, it is still the second largest industrial city in western India. After Breakfast drive to Rajkot upon arrival check in into the Hotel later Half-day Sightseeing which includes Aji dam, Ishwariya Temple, Swami Narayan temple & Overnight stay at Rajkot. Rajkot was founded in the year 1610 A.D. by Chief Vibhaji Jadeja & RajuSandhi. Rajkot was once the capital of the princely state of Saurashtra. Today it is best known as the town where Mahatma Gandhi spent the early years of his life when his father was a Diwan or Prime Minister to the king of Saurashtra. 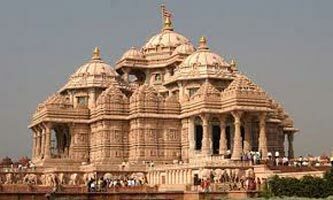 Rajkot is famous for its BandhaniSarees, mirror-work, patchwork, beadwork and silk embroidery. 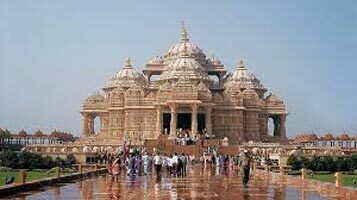 After Breakfast drive upon arrival check in at the Hotel & Dwarka Local Sightseeing (Bet Dwarka, Nageshwar Jyotirlings, Rukmini Temple Etc), DwarkadishAartiDarshanIn Evening & Overnight stay at Dwarka. Dwarka also spelled Dvarka, Dwaraka, and Dvaraka, is a city and a municipality of Jamnagar district in the Gujarat state in India. Dwarka (Dvaraka in Sanskrit - used in this article when referring to the city in a historical context), also known as Dwarawati in Sanskrit literature is rated as one of the seven most ancient cities in the country. The legendary city of Dvaraka was the dwelling place of Lord Krishna. It is believed that due to damage and destruction by the sea, Dvaraka has submerged six times and modern day Dwarka is therefore the seventh such city to be built in the area. After Breakfast drive to Somnath via Porbandar the Birth Place of Mahatma Gandhi, Gandhi Ashram and GeetaMandir upon arrival check in at the Hotel later evening visit somnath Temple, attend evening aarti. Overnight stay in the hotel. Somnath is about 5kms from Veraval. It is believed that the Somnath temple here was originally built by Somraj, the Moon God himself, out of gold, and then rebuilt by Ravana in silver and then by Krishna in Wood, then by Bhimdev in stone. The shore temple of Somnath was believed to have been built in 4 phases-in gold by Lord Soma, in silver by Ravana, in wood by lord Krishna and in stone by Bhimdev. Somnath is one of the 12 jyotirlingas of lord Shiva. 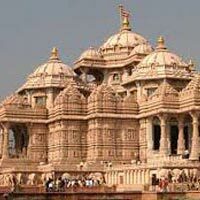 Somnath is also known as PrabhasPatan. After Breakfast drive to visit SasanGir (45 Km). An Asiatic Lions of Gir National Park, Evening visit the Lion Sanctuary (Jeep safari Optional). Overnight stay at Somnath. SasanGir Lion Sanctuary, which lies on the southwestern fringes of the Saurashtra Peninsula (west-central India), is the last home of some 300 Asiatic lions. It was created in 1913 to protect the largest surviving groups of the Asiatic lions. It was given a sanctuary status in 1965. The vegetation in the area consists of teak with a mixture of deciduous trees, including sal (Shorea), dhak (Buteafrondosa), and thorn forests. A few springs also exist, but their flow is rather eccentric depending upon the season. Gir Forest is today the only place in the world outside Africa, where the lion can be seen in his natural habitat. After breakfast drive to Diu on A sea cost available the best beach of Gujarat. On arrival check in at a Hotel & Full day enjoy the beach activity Overnight stay at Diu. Diu is a city in Diu district in the union territory of Daman and Diu, India. It was the location of the pivotal Battle of Diu in 1509 between Portugal and a combined force of Turkey, Egypt, Venice, the Republic of Ragusa (now known as Dubrovnik) and the then Sultan of Gujarat, Mahmud Begada. Diu District is an island lying off the south coast of Gujarat Kathiawar peninsula, separated from the mainland by a tidal creek. It has an area of 40 km², and a population of 44,110 (2001 census). The town of Diu lies at the eastern end of the island, and is known for its fortress and old Portuguese Cathedral. It is also a fishing town. The village of Ghoghla, which lies on the mainland opposite the eastern end of the island, is also part of the union territory. Note that in Google Maps you can find Diu with the name of Dangarvadi. Bhavnagar: An 18th century city, Bhavnagar is a premier cotton-exporting sea-port on the south-eastern Saurashtra coast. Today, Bhavnagar is known for Gandhi Smriti, an institution built in memory of Mahatma Gandhi, the Barton Museum, the Central Salt and Marine Research Institute,Takhteswar temple and Gauri-Shankar lake. Lothal is one of the most prominent cities of the ancient Indus valley civilization. Located in Bhal region of the modern state of Gujarat and dating from 2400 BCE, it is one of India most important archaeological sites that date from that era. Discovered in 1954, Lothal was excavated from February 13, 1955 to May 19, 1960 by the Archaeological Survey of India (ASI). Lothal dock—the world earliest known—connected the city to an ancient course of the Sabarmati river on the trade route between Harappan cities in Sindh and the peninsula of Saurashtra when the surrounding Kutch desert of today was a part of the Arabian Sea. It was a vital and thriving trade centre in ancient times, with its trade of beads, gems and valuable ornaments reaching the far corners of West Asia and Africa. Lothal people were responsible for the earliest-known portrayals of realism in art and sculpture, telling some of the most well-known fables of today. Its scientists used a shell compass and divided the horizon and sky into 8–12 whole parts, possibly pioneering the study of stars and advanced navigation—2000 years before the Greeks. The techniques and tools they pioneered for bead-making and in metallurgy have stood the test of time for over 4000 years.